The next morning I went out shooting with Ethelredor rather, to watch Ethelred shooting; for my principles will not allow me to take a direct part in blood sports. In many cases villains have a form of, well, “morality,” for lack of a better word that, in its purity, far exceeds the rationale and beliefs of the protagonists involved. Last issue, I discussed this in relation to characters who have been driven into the domain of villainy by their inflexible sense of right and wrong. Characters like Dr. Anton Phibes and Dr. Janos Rukh in The Invisible Ray becomes villain because of their rigid code of ethics and their pathological pursuit of justice. But there is another side to the “moral villain: the situation where a character who (often with a sense of great pride) has committed all manner of crimes and outrages is held back from some particular act by a personal sense of right and wrong. Such characters may have no problem breaking the rules of society, but their own ethics are inflexible. These villains hold themselves above chaos by creating and adhering to their own code of conduct. They know what they do is wrong by other standards; but the strength of their convictions holds them above other criminals, and in some cases, above the entire world. Taking pride in their villainy, these evildoers find a higher purpose behind their crimes, even if the purpose is their own cleverness. They regard themselves as free of the worldly constraints, either because they are too clever to be penned in by the rules of society or because of some crime (real or imagined) that was committed against them. They feel that the end justifies their criminal (and apparently evil) means. But to keep themselves from becoming just like those they oppose, they adhere to a code of honor; for example, robbing the rich but giving at least some of the loot to the poor. To counter their guilt, or to remain focused on their grander tasks, these characters often adhere to their code with such tenacity that it will often force them into situations where they find themselves acting at cross purposes to their own desires. In some cases, they slip into the territory of anti-heroes: for example, the jewel thief who helps to catch another crook (To Catch A Thief), or the killer who works with the police to catch another killer (Silence of the Lambs). These sometimes vicious, terrifying peoplefor whom the law has no meaning whatsoevercling almost desperately to their own rules, their own ethics, even when it might result in their doom, or compel them to work for the “enemy”. Ive already mentioned guilt, and its worth pondering for another moment. These people are usually intelligent, often much more so than anyone else in the story, and they must be aware of the effect of their actions. Yet they continue to do terrible things, sometimes driven by needs (the desire to steal, kill, and so forth), damaged sympathies (they are superior, and so have the right to act as they do), or what they see as a higher purpose (the end justifying the means). Without their code of ethics, theyd be nothing more than animals in mindless pursuit of personal pleasure or purpose. But with their personal ethics in place, they are able to justify their efforts. Their sense of honor becomes the governor of their actions: a rule of law for those who have set themselves above the laws. A villain who doesnt have a personal sense of right and wrong becomes raw id, desire without control. The cinema is packed with these creatures, usually no more than primal forces creating a sense of threat for the protagonist. They usually have no more personality than a storm, their character defined by the theme of their brutalities rather than a fully-realized personality. Michael Meyers from the Halloween films is a perfect example of this: the prototypical adversary as unstoppable force, as is anything with a mask and a meat cleaver. These kinds of adversaries are not sympathetic and they hold attention only because of the terror they create in their adversaries. Because they have no regard or understanding for anyone save themselves, there is no higher power to call them to account. They can sometimes be reasoned with, but without a code of ethics their betrayal is expected, at least by the audience, if not by the other characters in the film. But with a code of honor, however subjective, these characters who obey no other law become accountable for their actions. In films with “honorable” villains, the pleasure is the twist that, despite their often offensive actions and socially unacceptable goals, their honor makes them responsible. When they break their own rules, they are suddenly as emotionally lost as anyone else who has transgressed. In that state, the villain is tried by the only court that matters to them: the internal court of honor. Two films that beautifully portray ethical villains are products of that wonderful British cinema system, Ealing Studios. British film is resplendent with honorable scoundrels, more than likely because of the tradition of the “gentleman” whose word is his bond: you might be a scoundrel, but an honorable scoundrel is still a “gentleman,” albeit a colorful one. 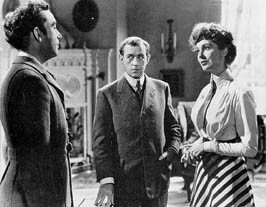 Perhaps one of the best films of this type is Robert Hamers 1949 film, Kind Hearts and Coronets. Working from Robert Hamers and John Dightons excellent screenplayand based on Roy Hornimans novel, Israel RankHamer has created the definitive black comedy of manners, a witty and urbane story of the use of murder for social ascension. The story is consummately British: the main character, Louis Mazzini (Dennis Price, in a wonderful performance), is driven to cold-blooded murder not for money (though thats a factor) or revenge (though thats certainly part of his motivation) but because of the social standing that was stripped from his beloved mother (Audrey Fildes), and thus himself. In fact, Mamas crime was a crime to no one save the upper crust: she fell in love with a common musicianand of Italian extraction, no less. Cut off from her wealthy and privileged family, the DAscoynes, she is forced into the most humiliating of situations: having to work for a living. Its easy to see Louiss murderous pursuit of the DAscoyne family as revenge for the shunning of his mother, or to gain the wealth rightfully due him, but its obvious that it is more important to Louis to regain the social status that being Lord DAscoyne could bring. He never relinquishes his lordly manners and attitudes, never allows a sense of commonality to enter into his life. Throughout “Kind Hearts“, Louis maintains a sense of haughty control, a “stiff upper lip”, even while imaginatively and competently dispatching any member of the DAscoyne family who stands between him and his Lordship. Despite the fact that Louis is the lead character, he remains, at heart, a villainthough one by whom we are thoroughly charmed. Since there is no hero in the film, Louis becomes the consummate anti-hero. We cheer for him to succeed, applaud his inventiveness, audacity, and desert-dry wit. His victims receive very little screen-time, becoming essentially non-people, props for Louis to knock over. This is well-evidenced by the fact that they are played to perfection by only one actor: Alec Guinness. Despite Guinnesss versatile performance, the members of the DAscoyne family never become true human beings, and so make Louiss crimes less affronting. We are even spared the sight of any blood, the DAscoynes expiring either off-camera or by simply slumping in their chairs. One of the few cases of true cad-like behavior from Louis is when he takes the married Sibella (a former childhood sweetheart to whom he once impulsively proposed, played by Joan Greenwood) as a lover. Aware of the offense, Louis nevertheless proceeds, glorying in the punishment he has thus inflicted on Sibella who turned him down not because of love, but because of Louiss social status. Louis finds every opportunity to torture both Sibellaby becoming everything shed wanted: attentive, disciplined, with social standing up the wazooand her idiotic lout of a husband, by gradually achieving (through murder) a higher comparative social position. A prime example of the ethics of Louis is the last murder, the one that determines whether he will be Louis Mazzini or Louis DAscoyne. While hunting with Ethelred DAscoyne, he observes: “The next morning I went out shooting with Ethelred, or rather, to watch Ethelred shooting; for my principles will not allow me to take a direct part in blood sports.” In one sentence, Louis sums it up: he is a man of honor, of scruples. Murder is one thing, the means to an end he believes he so justly deserves, but to kill an innocent, even if only “game”, would be butchery. He also shows how elegantly he sets himself above his victim. Ethelred DAscoyne is a man who would hurt the innocent without qualm, simply for the pleasure of murder, or cut someone like Louiss mother off from the support and security of her family because she had the gall to marry someone not of their social standing. Going shooting with Ethelred DAscoyne is an activity that Louis sees as not only the perfect opportunity to accomplish his murderous goal, but as the culmination of a delicious series of ironies. At the start of their hunt, Ethelred comes across a poacher caught in one of his man-traps, and has his servant beat the mana deplorable punishment that shocks Louis. Shortly after this, when he and the last DAscoyne are alone, Ethelred himself gets trapped. It is the perfect set-up for his accidental death at the hands of Louis. The ultimate irony is reserved at the end for Louis. The film is framed by the impending execution of Lord DAscoyne (Louis) for murder. Writing his tale before his appointment with the hangman, Louis tells his story in flashback, causing us to wonder which of the DAscoyne murders he was pinned for. Only then do we realize that for all of his elegant plans, dry precision, and carefully executed....executions, Louis is facing death for the one murder he didnt commit. A nice turn that gets even better, and a surprise I wont ruin, but that beautifully uses a simple cinematic device to get in one last jab at our expectations. Devices and wonderful plotting aside, Kind Hearts and Coronets remains a prime example of a man with his own personal code of conduct. Louis knows what he is doingkilling off all those Alec Guinnessesbut feels that his personal cause is much more important. He doesnt kill for the love of killing. He (generally) uses his skills only to further his ascent. Despite how he achieved his standing as a Lord of the Empire, Louis never loses the most precious thing in his world, his standing as a “gentleman”. The Ladykillers (1955) is another example of the ethical adversary. From from the same studio and the same era, The Ladykillers is a charming film with deceptively innocent with a bite that becomes more poignant after repeated viewings. While the film telegraphs its point rather obviously, the meticulous screenplay by William Rose keeps the the story from becoming trite or forced. The set-up is quick and simple. Mrs. Wilberforce (Katie Johnson) is the “dotty old dear”, a charming (if frustratingly naïve) old widow who lives in a house near Kings Cross station. One day, “Professor Marcus” (Alec Guinness in a delightfully wicked performance, complete with hideous teeth) arrives on her doorstep to rent out a room so that he and his musician chums (yea, right) can practice. 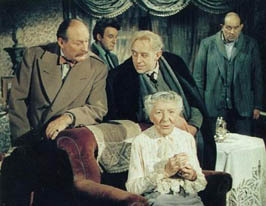 Unbeknownst to the simple Mrs. Wilberforce, the musiciansMajor Courtney (played by Cecil Parker), Mr. Harvey (also knows as Louis, played by Herbert Lom), Mr. Robinson (also known as Harry, played by Peter Sellers), and Mr. Lawson (also known as One-Round, played by Danny Green)are crooks who, led by Professor Marcus, are planning to rob the near-by station, using the innocent old lady to sneak the loot out. All of the characters are perfect examples of the crook with a higher sense of right and wrong. Even the obviously murderous Louis is not above at least being polite to the dear Mrs. Wilberforce, while the rest of the group are charmed (though periodically annoyed) by her constant, if courteous, intrusions with offers of tea and biscuits, or to ask for help in giving one of her obnoxious parrots its medicine. While frustrated by her, the gang tolerates her knowing that shes essential to their plan, and that she will be gone from their lives once she gets the money from the station. At best, they consider her an inconvenient reminder of the lives theyve left behind. She exists in the light, while they have to skulk in the dark; she can innocently talk to anyone, while they suspect everyone. They are frustrated with her lack of understanding of the stark realities of the world, but they would neverat firstview her as anything but totally oblivious to the true nature of things. In fact, her naïveté is essential to their plan. If Mrs. Wilberforce were too perceptive about her musician lodgers and the steamer trunk they ask her to pick up at the station, she wouldnt be of use to them. Its only after One-Rounds clumsy exposure of the crime does Mrs. Wilberforcealbeit slowlyput the whole thing together. But once again her innocence saves her. Realizing that her lodgers are the crooks who robbed the station, she insists that they accompany her to the local constabulary to turn themselves in. Trusting their promise to do so, she allows them to persuade her to wait until the morning. Its in this last portion of the film that the title turns true. Realizing that Mrs. Wilberforce is determined to alert the police, the hapless crooks draw lots to “do the old bird in.” Even Louis, the obvious choice, blanches at the thought of killing someone so frail, simple, and innocent. The first to draw the short straw is Major Courtney, who appears upper crust but is obviously the weakest of the gang, pathologically panicking at every minor crisis. Not unexpectedly, Courtney cant stomach the thought of strangling the old lady, and instead takes the much more criminally correct route of trying to make off with the money. His actions, and the reactions of the other crooks, say a lot about how they view the situation and each other. The killing of Mrs. Wilberforce, someone who is honest, trusting, and unable to defend herself (and by extension, of a world they may in some way want to return toa world of Sunday teas) is unthinkable. In their world, this violates a code, a rule of criminal society. Doing the deed would solve their problems, but it would cast them out of their circle and transform them into something they disdain: a ladykiller. While stealing from fellow crooks isnt acceptable, its familiar; its an accepted occupational hazard. Caught and “accidentally” killed by Louis, Courtneys crime infuriates the rest of the crooks. By trying to sneak away, he showed them for worse than soft; they were stupid to hand him the opportunity. Courtney raises the paranoia of the group considerably, placing the thought of further betrayal in all of their mindsexcept for One-Round, who is the first to flatly refuse to harm the old woman. So assured is he of his new role as protector, One-Round even goes so far as to threaten the others if they should try to harm her. One-Rounds transformation is very much indicative of the concept of a villain with morals: he even goes as far as to threaten to turn against his own criminal family. He recognizes that she is not guilty of any crime worth being “bumped off”not something he could say about anyone trying to hurt her, and so has no moral compunctions against avenging her with murder. The rest of the gang, though, still wants to escape with the money, and that means drawing lots again. Professor Marcus and Louis seem the most willing to commit the crime; yet once again, they resort to drawing straws to select the next one to try and kill the old woman. If either of them were as cold-blooded as they appear they would bypass the lottery and simply kill her. By using lots they assuage their sense of guilt. The next to draw the short straw is Harry, who then sends One-Round on a fools errand. As unwilling and unable to complete the deed as his predecessor, he takes Courtneys way out: trying to escape with the money. Ironically, One-Round returns from his errand and, believing that Harry was going to carry out the deed, kills him, accidentally murdering an innocent man. One-Round has no moral compunctions about killing him. The thought of someone harming the innocent old lady is enough to make him attack his own surrogate family. The film concludes with the quick dispatching of the dangerous One-Round by Louis (dumped in the open bed of a railroad hopper car), and Professor Marcus and Louis facing each other. The tension is obvious: they both want the money and they both believe they are capable of killing Mrs. Wilberforce, therefore one of them has to go. Showing the brilliance that made him the leader of the gang, Marcus cleverly kills Louisanother body in yet another hopper car. Then Marcus himself dies in a clumsy deus ex machina, implying that he, of all of them, would have had no ethical dilemma about murdering the old woman to keep her silent. Yet that gives us pause. If he always had the ability to kill her, then why didnt he simply do so? Why the charade with the drawing of lots? Marcus had an ethical sense, and the fact that he tried to talk Mrs. Wilberforce out of going to the police shows that murder was not the solution he sought first. His death (by railway signal) denies him the chance to test his ethics; he never had the opportunity to look the old lady in the eye and go ahead with her murder. Even without the clumsy ending, the film remains a wonderful romp: a band of hardened cutthroats, undone by their inability to perform what should have been the simplest of acts, killing a little old lady. The comedy is that for all their roughness, they are crippled by the innocence of their prey; the supposedly unethical, trapped in a moral quandary, undone by their own sense of right and wrong. In both these British films, the villains are the center of attention, anti-heroes in the ideal sense of the world. These stories are studies of codes of behavior, the rules the apparently lawless have set up for themselves. Both the gang in The Ladykillers and Louis DAscoyne in Kind Hearts and Coronets exist beyond “civilized” society, using theft, violence, and murder to accomplish their goals. Yet, because of code of conduct, they can be trapped in situations of “right” and “wrong,” because their personal ethic is more absolute and inflexible than that of the society they have left behind.